With over 81 per cent decline in shark landing registered since 1999 and lack of a proper mechanism to regulate shark fishing, marine experts feared that the country might get deprived of this marine species in coming years. Some conservationists are of the opinion that maintaining shark population is necessary to prevent the breakdown of our ecosystems. In this regard, they highlight the need for legislation to protect sharks and proper implementation of the Food and Agriculture Organisation (FAO) of the UN mandatory rules and regulations to ensure sustainable fishing practices. 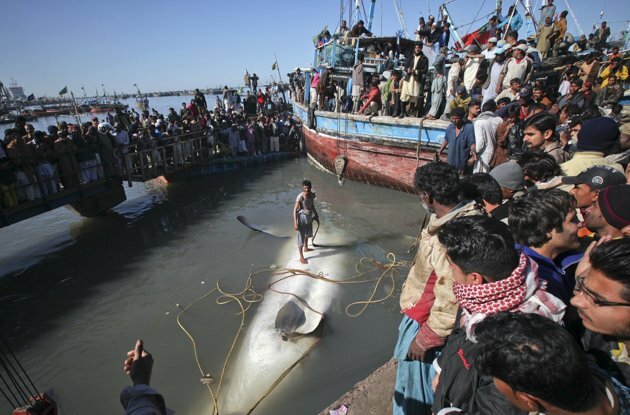 Director-general of the federally-administered marine fisheries department at the Karachi harbour Mohammad Moazzam Khan said there had been 81.25 per cent decline in shark catch since 1999. “In 1999, shark landing stood at 32,000 tonnes annually. There has been a sharp decline in shark catch since then. The 2009 data shows that the number of annual shark catch has reduced to 6,000 tonnes only,” he said. Recollecting his past observations, Mr Khan noted that shark fishing had been a very old practice in the country’s territorial waters. Of over 400 species existing across the globe, as many as 64 species of sharks had been recorded here so far. “The species spotted here included all the dangerous ones with exception to the great white shark – which is considered as one of the most dangerous species across the world. Some of those found here included tiger shark, hammerhead shark, mako shark, bull shark, silky shark, reef shark, hound shark, graceful shark and spinner shark,” he said. The official said shark hunting was mostly done with the help of special hooks, or sometimes by using bottom set gillnet. “At times live bait, usually grunt fish, is used,” he added. While the shark meat is entirely consumed locally, their fins are exported to countries such as Hong Kong and Singapore, according to him. The annual foreign exchange earned through their export might be between $300 and $400, he estimated. He said: “Sharks have a cartilaginous skeleton and their meat is generally consumed as finger fish at restaurants in Karachi. People eating finger fish might don’t know what they are actually consuming,” he remarked. Holding only local fishermen responsible for over-fishing sharks, Mr Khan said there had been a severe decline in shark catch since 2003. “The number of fishermen has increased massively over the years, directly impacting the marine resources. Often, foreign trawlers are held responsible for over-exploiting fish stocks, which is not true. There has been no operation of foreign trawlers since 2005,” he said. Dr Ijaz Ahmed of the World Wild Fund for Nature-Pakistan was, however, of the view that foreign interests were still involved in exploiting the marine resources though operating in a different way. “Many trawlers operating in the Pakistani waters today are actually owned by foreign companies and function through their local agents. These trawlers not only over fish, but also violate the sea limits allocated to them,” he said. Citing an FAO study conducted five years ago, Dr Ahmed said Pakistan was ranked 12th in a list of countries where shark meat was being exported at that time. “The situation must have changed by now. But, I have not come across any new study on the subject since then,” he said. Giving his input on shark fishing, Umer Waqas, the WWF senior conservation officer at Jiwani, Balochistan, said the hotspots of shark fishing included Jiwani and Gwadar as well as the towns of Ganz and Pishukan located between Jiwani and Gwadar. Asked about the daily catch of shark at Gwadar, he said it was difficult to confirm the exact number as there were many landing points. However, he added: “I have recorded and observed some interesting species that included hammerhead shark, grey bamboo shark, blacktip shark, pelagic thresher shark and spadenose shark. The data is being analysed and detailed information will soon be produced under a WWF project on the assessment of shark catch, landing on Balochistan coast and its export,” he said. Speaking of the price the fishermen get for their catch, he said it ranged between Rs100 and Rs150 per kilogram, depending upon the actual size of a shark. “The netted fish is transported to Karachi for processing and finning,” he added. He agreed that there had been a fast decline in shark catch. “In fact, many shark species are vulnerable to over-exploitation due to their biological characteristics of low-productive potential and, hence, having limited capacity to recover from over-fishing. “I have also recorded female sharks pregnant with pups inside their wombs. This shows that some sharks are being caught in the breeding season and that’s certainly an alarming situation, I believe,” he said. Recommending some measures for conservation, Mr Waqas said there was a need for legislation and indigenous action plan to protect sharks, besides implementing the FAO mandatory rules and regulations on sustainable fishing. “Maintaining shark population is necessary if we want to prevent the breakdown of our ecosystems. Sharks are among the top predators of the seafood chain so we cannot afford to lose them,” he concluded. With no legal protection in Pakistan, the shark species, locally called ‘mangra’ continue to face serious threats from over exploitation through unregulated commercial fishing. 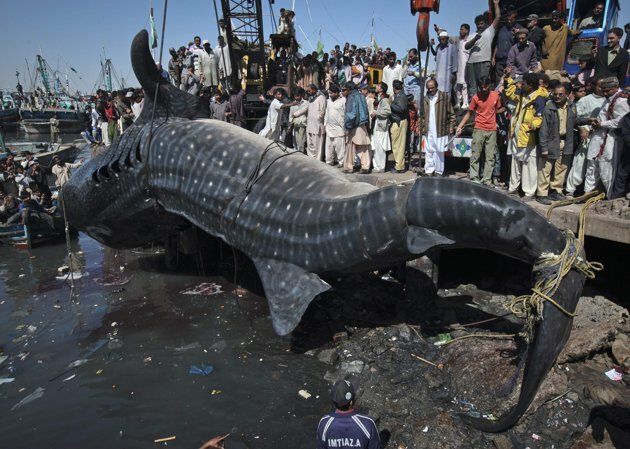 The shark total annual catch of Pakistan was reported as 55,000 tonnes in the 1980s which is now merely 8,000 tonnes. This is the very reason that WWF-Pakistan brought the Marine Fisheries Department, Food and Agriculture Organisation and Government of Maldives together to help in developing a national conservation plan. Maldives Minister of Fisheries and Agriculture, Dr. Muhammad Shainee visited Pakistan with his delegation to share their experiences as the Maldives has banned shark fishing and now generates more revenue from shark watching than they ever did from selling dead sharks, 2.7 million USD and 0.7 million respectively. While in Pakistan there is not even a close season for marine fishing. There are two months, June and July off from shrimp fishing which also supposedly provide some relief to fish. In addition to this there is no marine aquaculture which can release some pressure from our depleting marine fish resources. Faisal Iftikhar, the CEO of Fisheries Development Board said, “We used to export 4,000 containers of the Indian mackerel up to five years ago. It is now reduced to only 400”. 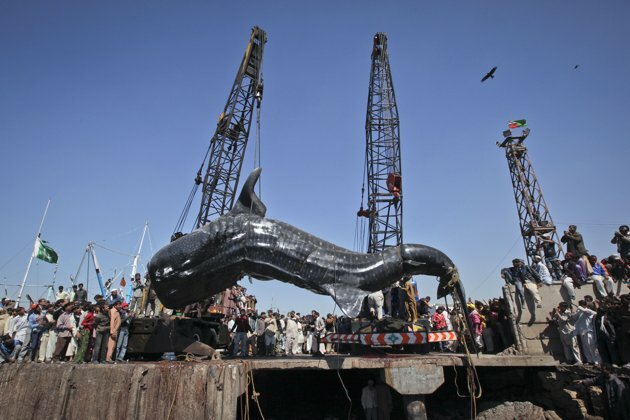 Records show that in Pakistan there was an auction of sharks in 1983 that would begin at seven in the morning would continue past 11 am because of huge quantities of sharks, said Maozzam Ali Khan, (former director general of Sindh Fisheries Department who is currently the Fisheries Advisor to WWF-Pakistan). Out of about 400 species of sharks, 144 have been reported from Pakistan. However, little is known about their population trend. Since 1985 only three specimens of the saw shark have been reported in Pakistan. Communities used the blade like snouts of saw sharks to make the boundary wall of their homes, like in Jiwani, or Pasni. Now saw sharks are the most threatened sharks. From 1986 to 2003 there was extensive use of bottom set gillnets that were used to fish at the depth of up to 300 metres which created havoc for sharks. Sharks are utilised to the fullest — shark fin is a delicacy and can fetch up to 400 USD per kilogram while its liver and skin are used in making poultry feed. Its boneless fillets are sold as salmon and liver is used to make poultry feed. Both, horror and mystic surround sharks and the least they deserve is ethical marketing. Ethical marketing is a problem with many species. Some shark species are threatened due to trade and that is the very reason that about 18 species have been included to the list of species which require export and import permits regulated under the Convention for the International Trade in Endangered Species of Wild Fauna and Flora (CITES). Pakistan is a signatory to CITES and has ratified it by developing a national law which is known as Pakistan Trade Control of Wild Fauna and Flora Act 2012. This means that export of these shark fins outside Pakistan now requires CITES permits otherwise it would be illegal. Marine Fisheries Department does not have data according to the species, so we don’t know what marine fish species have been on a decline. This kind of data is crucial in managing species. Sharks are extremely vulnerable because they grow slowly, mature late and have low fecundity. Some international chain of hotels such as Hyatt, Hilton, Mandarin Oriental group have taken sharks off their menu and some airlines such as Etihad, Singapore airlines, Cathy Pacific have pledged that they would not carry any shark product. The conservation of sharks needs stakeholder involvement especially fishermen, customs authorities and Marine Fisheries Department for the sole purpose of monitoring illegal, unreported and unregulated fishing.